Metz, France is the capital of the northeastern region of Lorraine, part of the larger Grand-Est region. Situated near the border of Belgium, Luxembourg, and Germany, this historic city has been called "the gateway to Europe." Just 90 minutes from Paris by train, Metz is at the heart of renowned arts, political movements, scientific innovation, and more. Today, Metz is known as much for its beautiful Gothic cathedral and the Centre Pompidou-Metz, as it is for being a center for innovation, driven in part by Georgia Tech-Lorraine. The Georgia Tech-Lorraine campus is located in the Metz Technopole, a short transit ride from downtown. As a key player at this crossroads of innovation and technology, Georgia Tech-Lorraine joins other prestigious French engineering and business schools, research labs, and business centers. The heart of Georgia Tech-Lorraine is housed in one secure building where you will find classrooms, labs, faculty and administrative offices, and a student lounge. The small campus fosters a strong sense of community, and students enjoy small class sizes and highly accessible faculty. The Georgia Tech-Lorraine campus building is accessible with an electronic key fob that is provided to each student upon arrival. Each student is required to submit a refundable deposit of €20, paid in cash/euros only. Note: Access to the building is available from 6am to midnight, 7 days per week, with the exception of the last two weeks before the final exam period. – In the two weeks leading up to final exams, students will have access to the building 24 hours per day. When students arrive, they will receive their personal GTL computer account (ID + password). Students will have access to the Computer Lab everyday during building opening hours. For additional information regarding computer access, please contact the system administrator, Jean-Jacques Michel. Important: You must access and check this account daily as some Georgia Tech-Lorraine specific information is provided only through the email related to that account. For additional information regarding computer access, such as forwarding emails to external accounts, resetting local passwords, etc., please click here (IntraWWW). Slides of the computer orientation: Computer Orientation for Fall 2018. The GTL campus library is a technical and scientific library with all of the basic textbooks for the required courses. The library is open during building operating hours. One copy machine is located on level 2 and is accessible with a personal ID and password. The cost is 3 euros for 100 copies and 5 euros for 200 copies. Printers will be available for student use in the computer lab and in the student lounge. Similar to the policy at Georgia Tech in Atlanta, students will have a limited number of pages they can print each week. Undergraduate students live in residence halls just a short walk away from campus. Most dorms offer studio apartments complete with a small kitchenette and full bathroom. There is also an option of two-person apartment-style rooms that can be shared with a Georgia Tech-Lorraine student, or in the Fall and Spring semesters, a French student from a nearby engineering school! Housing costs are significantly lower in Metz, than in the residence halls of Atlanta! If you have a housing contract on campus, Maleia Lewis, in the GTL Atlanta office, will provide you with a signed form so that you can break your contract without penalty. You will receive guidance on what to pack during the mandatory orientations. Cookware and bed linens are provided. At the beginning of each semester, a "Swap Shop" will be hosted, during which time you will have the opportunity to choose items left behind by previous students, such as small appliances, fans, and cookware. There is also a textbook purchase process from previous semesters' students organized by the Georgia Tech-Lorraine staff. If you cannot find what you need, you can either bring your pre-purchased textbooks or have them shipped to the Georgia Tech-Lorraine campus building. Most graduate students live in the ALOES residence hall just a short walk away from campus. Families may wish to find an apartment downtown or close to campus. Most dorms offer two-person apartment-style rooms with a communal kitchen. Students have 24/7 access to an emergency contact at GTL who can advise on how to obtain medical care. All students are given an emergency card on arrival with pertinent phone numbers and emergency procedures. An English-speaking nurse keeps office hours at Georgia Tech-Lorraine several days a week and can refer students to local doctors if needed. Students will learn about the nurses hours during their orientation at Georgia Tech-Lorraine. Food is at the heart of French culture - and there are so many options! You'll become adept at making your own meals in your dorm room's kitchenette. Or, take a look at some of the other options below. Students can eat lunch and dinner at the local student cafeteria, CROUS. You'll learn about getting a meal card at the beginning of the semester. Summer students will have meal plan for lunches only on the days they are in class. There are two nearby grocery stores: CORA and Simply. CORA is along the lines of a Super WalMart, where you can get your hair cut, buy clothes, groceries, and maybe even a chocolate croissant. Simply is a smaller grocery chain with fresh fruits and vegetables. At the beginning of the semester during the swap-shop, students can pick up several reusable grocery bags to assist with trips to the store. There are many restaurants in Metz and the Technopole area, and some are close to campus. For a full list of restaurants around Metz, see the city's restaurant listings. There are always things to do around campus and around the city! Similar to the Student Government Association of Georgia Tech-Atlanta, the BDE plans events for and supports the student population. Past events have included indoor skiing, karaoke and go-karting, amusement parks, Super Bowl parties, cheese and chocolate tasting, and more! Get involved with the BDE and take part in the planning! BDE elections will be held early in the semester. Whether you are a beginner who has never studied French, or someone who wants to brush up on the French they learned in high school, our "FLE" (Français Langue Etrangère, or French as a Foreign Language) courses will give you the tools you need to start communicating with the locals. From simple words and phrases to complete dialogues, learn enough vocabulary, grammar, and idiomatic expressions to handle yourself while traveling in France or in everyday situations. Classes are held on Mondays (beginners) and Wednesdays (intermediate to advanced). 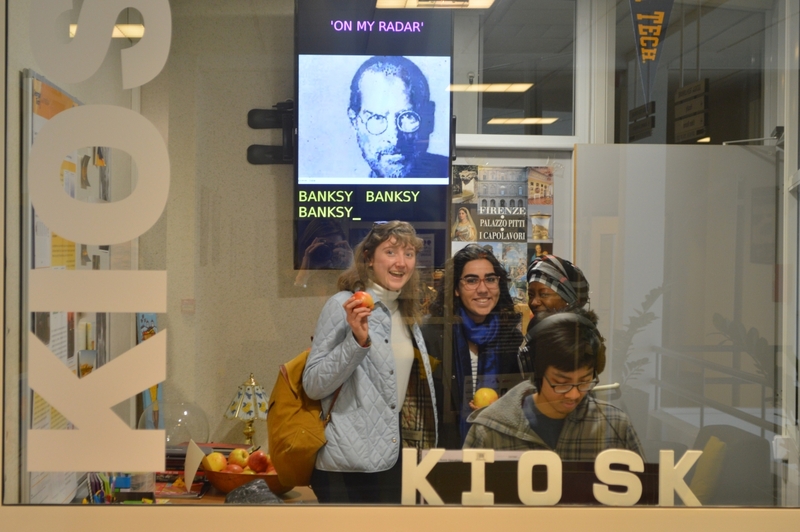 Stop by the kiosk for an apple and to find out what’s going on in Metz! The brainchild of one of Georgia Tech-Lorraine's French professors Sonia Serafin, the Leonardo Program takes Georgia Tech-Lorraine students on cultural excursions that would otherwise be essentially inaccessible to students, such as fruit picking, behind-the-scenes rehearsals of the National Orchestra of Metz, opera and ballet performances at the Metz Opera, visits to the Centre Pompidou-Metz, a fancy French lunch and etiquette afternoon, and more! For more details and other excursions, check out our blog, written by current students, To GT-Lorraine and Beyond! Check out the kiosk at Georgia Tech-Lorraine for more information. In the Spring, Professor Serafin will be adding a bi-weekly singing workshop. Gym: Georgia Tech-Lorraine staff and the BDE work to establish a schedule with a local university’s gym each semester, based on availability. There are also several reasonably priced gyms in the Technopole. Additional information will be provided upon arrival. Soccer: The fields located across the lake from Georgia Tech-Lorraine have set times for use by Georgia Tech-Lorraine students. This is a great way to meet and connect with local students, but you may want to start referring to soccer as football - you are in Europe, after all! Basketball: Students usually have access to a court and are sometimes invited to form a team to play with a local team. Softball: Students can participate in a softball tournament with teams from nearby schools. Soccer: FC Metz is a professional football team playing in Leagues 1 and 2. Their stadium is a bus ride away, and tickets are affordable. Get into the football spirit during a Friday night home game! Handball: Metz Handball plays in the French Women's First League. The handball club has won multiple championships across France, and tickets are still reasonably priced. As we're sure you've heard, Georgia Tech-Lorraine students are expert travelers. Now it's your turn! Check out our official blog, written by and for students, "To GTL...and Beyond!" to learn more about what life is like at Georgia Tech-Lorraine - and find some inspiration and tips for your dream travels! Check out our Vlogger, Lubby's Travels! Independent travel is an important part of the Georgia Tech-Lorraine experience. In the Fall and Spring semesters, students have 3-day weekends to travel Europe. And you will have one week off for Fall and Spring break. Summer students will have 3-day weekends, with the occasional 2 or 4-day weekend. But, don’t start planning yet--dates for breaks will change from semester to semester. Between a Eurail pass, budget airlines, and discount buses, students travel all over France and Europe. Every weekend is a new adventure! The closest station to Georgia Tech-Lorraine is Metz-ville, which also offers shuttle service to the Lorraine TGV Station. Students use our closed Facebook page and GroupMe to help with trip planning. You’ll always find someone to travel with. Enjoy writing and getting involved? Check out our Eurail Blogger Contest, offered in the Fall and Spring semesters, and you could win a Eurail Pass in exchange for writing a few weekly blog posts. Although you likely won’t have as much time to travel as our undergraduate students, when you are ready to go you will be within easy reach of many exciting destinations within Europe.